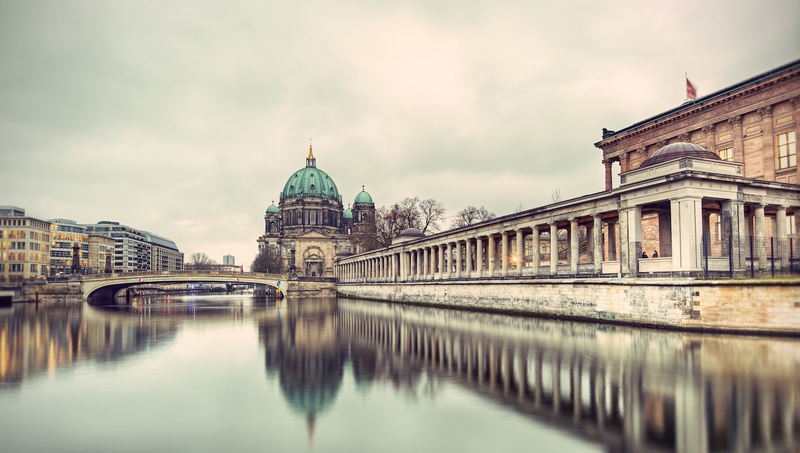 The Berlin Cathedral history is rich, mirroring the ups and downs of the city itself. The first of the fun facts about this family church: The Cathedral is not an actual cathedral because the church isn’t the seat of a bishop. The first church on this site finished construction in 1465 and looked very different than it does today. It served the Hohenzollern family, whose palace was located nearby. 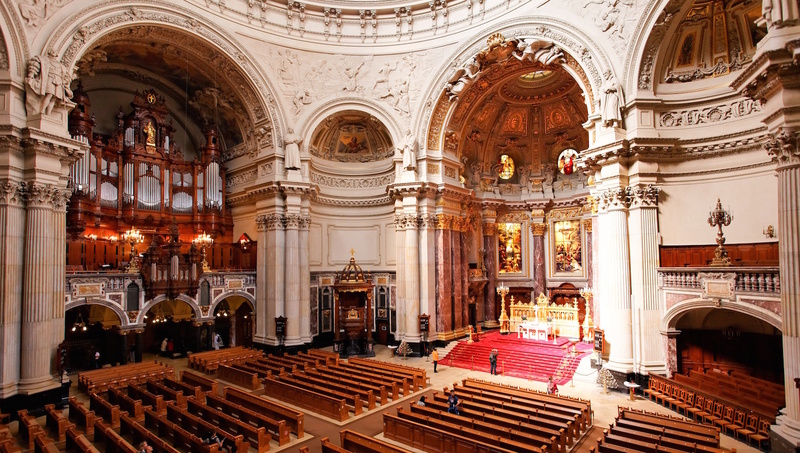 A Baroque cathedral replaced the church in 1745; in 1816 it was remodeled in classical style. The cathedral we know today wouldn’t be built for nearly a century. 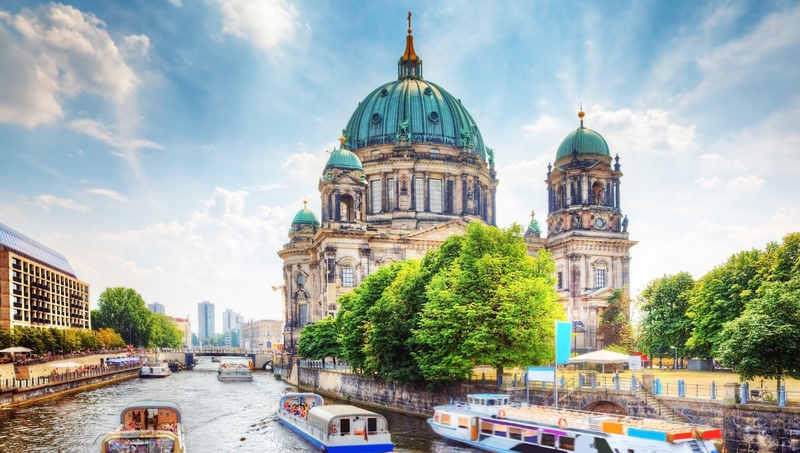 Larger than any of the other previous buildings, the Protestant cathedral was built to contest St. Peter’s Basilica in Rome with a 98-meter-tall dome decorated with mosaic. 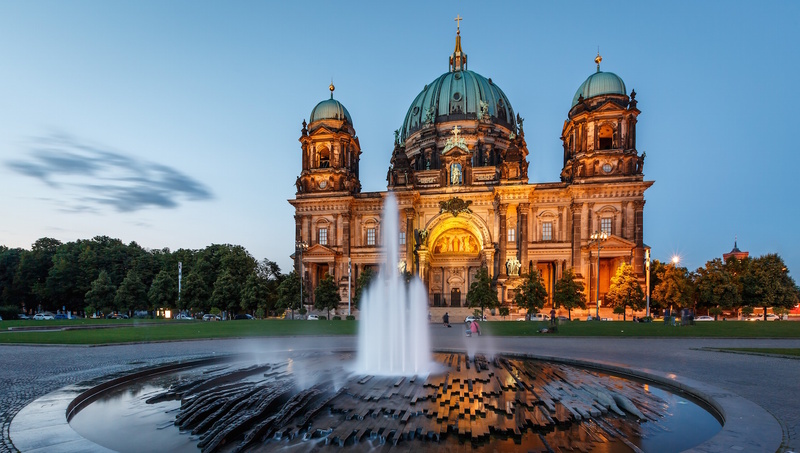 The ambitious project, designed by Julius Raschdorff in high Renaissance fashion was completed in 1905, along with the famous Berlin Cathedral organ in all its 7,000-pipe glory. The magnificent building was bombed during WWII and later set to be demolished by Soviet Germany. Withstanding the odds, reconstruction went underway in 1975. Below the cathedral lies a crypt filled with 94 coffins, some of which are preserved royal bodies. The oldest tomb belongs to the elector of Brandenburg, Johann Cicero (153). Members of the original Hohenzollern family are buried even deeper in the Hohenzollerngruft. Climb the 267 steps for a breathtaking overview of the grand interior. 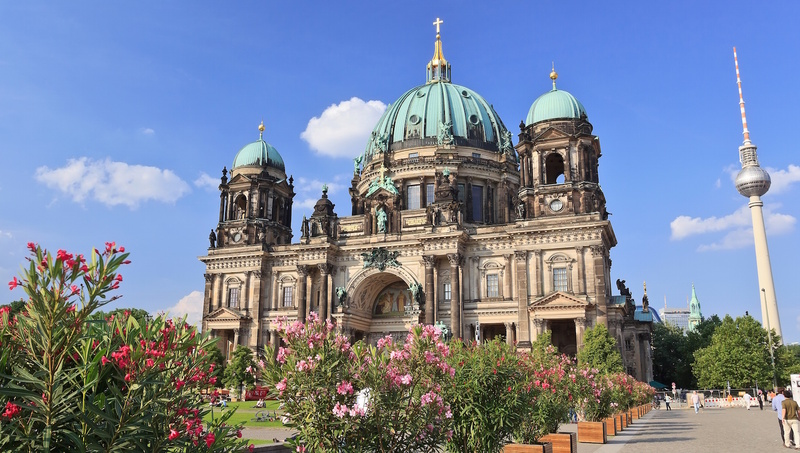 At the very top, you can even walk outside around the Berlin Cathedral dome and take in all of Berlin-Mitte. Open Monday through Saturday, 9:00AM to 8:00PM, Sundays and Holidays, 12:00PM to 8:00PM. October 1 through March 31, closing at 7:00PM. Adult tickets start at just 7€ and continue upwards with tours. A guide inside the Cathedral is not necessary. Take the U2, U5, U8, S5, S7 or S75 to Alexanderplatz and it's a short walk through an iconic section of the city. Visit on a clear day and climb to the top of the dome for incredible views of the city. An elevator is available to the left of the main entrance, and a bell calls the concierge who can assist with entrance.